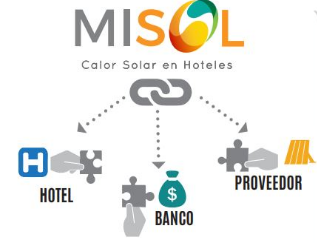 The pilot phase of the support scheme MiSol - Solar Heat for Hotels on the Yucatan Peninsula in Mexico was successful. On 3 May, the first MiSol-supported solar system at a La Quinta Inns & Suites Hotel was inaugurated. MiSol has been promoting the use of solar thermal among 80 hotels on the peninsula close to Cuba since last June. Its administrators have evaluated 20 proposals so far. Recently, it has also been decided that the programme’s scope is to be broadened to allow for applications from service sector companies located across the entire country. The new rules are planned for introduction in January 2019. “We have learned a lot during the pilot phase of MiSol. We have been faced especially with technical challenges concerning existing hot water installations. To add the solar unit and achieve an increase in performance, the entire water heating system must be analysed and energy efficiency measures need to be part of the deliberations,” said Pablo Cuevas. From his office in Cancún, he has been coordinating the programme in collaboration with a technical advisor and between three and five students from the city’s Universidad del Caribe. One of the main objectives of MiSol is to instil confidence in solar energy use in tourism, for example, by offering free technical and financial advice to hotels ranging from two to four stars. Hoteliers who are interested in the programme can complete an online form at www.misol.mx. Subsequently, its administrators will conduct an initial assessment and distribute it to registered suppliers, to inform them about the relevant technical and financial requirements. MiSol will then verify, validate and forward the quotations it receives from suppliers to the hotelier, who can select the most appropriate offer. Once a project has been assigned, the supplier will create engineering specifications together with the customer. Throughout the entire process, MiSol will be supervising the work, including installation and commissioning, and begin monitoring the system as soon as it comes online. If a MiSol-accredited supplier has already found someone who is interested in buying a solar heating system but needs access to a credit facility, MiSol will evaluate the technical and economic potential of the project prior to any loan contracts being signed. Via a bank called Banbajío, hoteliers can get loans with a duration of up to five years to purchase and install a solar thermal system. How much interest customers will have to pay depends on the level of the relevant TIIE, i.e., interbank equilibrium interest rate, to which 6 percentage points will be added for investing up to Mexican Peso (MXN) 8 million – around EUR 370,000 – or 5 points for investments between MXN 8 million and 16 million. MiSol is a collaborative effort of several Mexican institutions. The Secretariat of Energy, also known as SENER, is the organisation managing the programme, whereas Mexico’s Bancomext development bank offers guarantees and funding. Its coordinator is the National Commission for the Efficient Use of Energy, or CONUEE, which is also responsible for technical supervision. The Cancún office of the United Nations Development Programme, or UNDP, has been put in charge of on-site operation and quality assurance. Likewise, suppliers must provide proof that they have technical staff able to install systems according to EC-0325 (thermosiphon) and EC-0473 (pumped) regulations. Considering the great potential for solar water heater use in Mexico’s service sector, the scope of the support scheme will soon span the entire country. New criteria for eligibility will become available in January 2019 and be valid for three years. There are also plans to establish a second regional office besides the one in Cancún. This text was written by Marisol Oropeza, a German/Mexican communications and marketing specialist who focuses on solar heat in Germany (marisol@matters.mx).